Finally. Finally a biopic that doesn’t treat its story beats like attention grabbing headlines. Finally a camera willing to linger in the right moments without reveling in or dismissing pain. Finally a “true story” film that recognizes that themes like strength, perseverance, and even patriotism can absolutely be expressed through personal, intimate human moments. I’m not saying Stronger is a pioneer in those areas, but I’ve been conditioned to expect a certain type of film with these biopics, i.e. a sanitized, rushed, and ultimately dismissive Greatest Hits reel that does a disservice to real life struggles. Thankfully, that’s not what we get here. A crowdpleaser in the same vein as last year’s Hidden Figures. It doesn’t do anything remarkable, but it coasts on its galvanizing real life story and the unwavering charm of its talented cast. Stone and Riseborough in particular bring some heart to their characters’ romance, even though the latter gets the short end of the stick when it comes to character development. Perhaps time would’ve been better spent on her rather than on Carell, who thank the lord is entertaining as hell because any drama that revolves around his character feels forced and half-baked. When the film zeroes in on Billie Jean King, it oftentimes shines, so the drama needlessly being diluted across several characters is unfortunate. Nevertheless, an altogether very pleasant experience, especially due to Nicholas Britell’s beautiful score and Linus Sandgren’s unfussy, period-appropriate shooting approach. Sandgren truly does have an eye for the way colors work in tandem, creating a vibrant but calming presence in the background. Attended the premiere. Saw everyone. Met Linus Sandgren, Bill Pullman, Sara Bareilles, and Justin Hurwitz. Was cool. This is a tough one. Parts of it are intense, full throttle filmmaking, the type of contained space pressure cooker that’s right up my alley. Other parts are exceedingly dumb, the type of faux profound grandstanding that spews from the mind of a guy who probably got a few too many pats on the back when he was younger. And no, just because certain elements of the script seem to deal with this notion of celebrity–and arguably with the meaning of Aronofsky’s own place in the world as a creative mind–that does not for one second excuse his poor choices. When I evaluate films that are ridiculous and campy like this one is at times, I wholly appreciate it if and only if I get the sense that the filmmaker understands and embraces what he or she is doing. From Aronofsky, I get the sense that his form of self awareness is a form of smug self-seriousness rather than a driver of the cinematic experience. Now, the Aronofsky Touch worked in Black Swan, but that’s because that film was a true psychological thriller, a more tightly structured piece that had more to say about fewer things. Tags: Beating heart visions mother!, Darren Aronofsky mother! director writer, Dead son Brian Gleeson wake funeral mother!, Domhnall Gleeson Brian Gleeson fight scene will mother!, Ed Harris Man coughing Adam's Rib mother!, Ed Harris Michelle Pfeiffer Adam Eve mother!, Ending scene different Mother analysis film, Environment allegory message theme mother!, Javier Bardem crystal symbolism mother!, Javier Bardem rips out heart Jennifer Lawrence mother!, Jennifer Lawrence dating Darren Aronofsky, Jennifer Lawrence Javier Bardem mother!, Jennifer Lawrence Mother blows up house explosion ending, Kristen Wiig mother! film, Kristen Wiig publisher book Javier Bardem, mother! film explained analysis, mother! film review, mother! 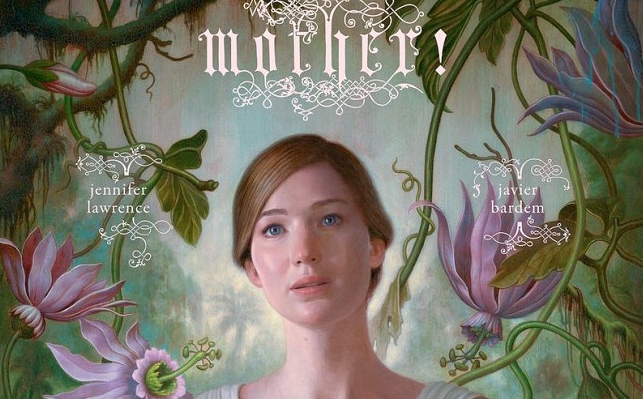 film review controversy, mother! film trailer horror, mother! pregnant Jennifer Lawrence, mother! religious allegory Mother Earth, mother! religious allegory references, Mother's son neck snapping eating scene mother!